*Due to Blogger"s recent "issues," we are adjusting blog posts a bit. Guest Blogger Angie Breidenbach will be with us on Friday to talk about Hope's Promise, and our review of her new devotional, Gems of Wisdom, will be on Thursday. In the meantime, enjoy . . . I think I'm allergic to onions. Or maybe just the purple (or red, for those of you who call them red) onions I bought from Sam's Club last month. Each time I chopped one of those onions, I got juice on my hands, and within an hour of the chopping, my fingers began to itch. And my arms. And my feet. What convinced me that the itching might be an allergic response to onions was that (1) I could still smell the onion juice on my hands even after washing them several times with soap and (2) each time I touched another part of my body, that touched spot began to itch. While I do generally tear up when chopping an onion, with these red ones, my eyes didn't just water. They burned. We're talking some strong onions. Yet they taste soooo good. Well, I did some googling of onion allergies because I actually doubted my theory. (It's better than being allergic to pumpkin pie filling.) Based on the research, I learned there are quite a few symptoms to onion allergies, although the condition is rare. NONE of the internal symptons, though, are ones I have from either touching or eating onion. My only problem is the itching. We're talking swollen hands and feet and lots and lots of itching. I'm itching just thinking about itching. Still, I love onions. All kinds. I'd say it was because of their layeredness. I'm a layered gal. Probably because I don't like to be cold. But the reality is I just like the taste of onions. Logic says don't eat or touch red (or purple for those of you who call them purple) onions. I know, I know, I know. Uggh! It's just not fair to like something that causes a negative response. We can all probably name a something we like to do or eat or say . . . and yet that same something causes all sorts of problems in us, for us. Books. Movies. Friends. Food. Drink. Sports. Et cetera, et cetera, et cetera. I like to stay up late, but doing so means I don't get enough sleep which means I'm grumpy and irritable in the morning. No one will ever accuse me of being a Morning Person. Steven James in his book, SAILING BETWEEN THE STARS, says there are two kinds of people in the world. "One group is the Morning People. We all know who they are. They're easy to identify, with their big shiny teeth and enthusiastic handshakes and peppy Time To Go Do Yoga And Greet The Day! speeches. Most of us are the other group. No, we're not Evening People or even Afternoon People. We're Anti-Morning People. You probably know right off the bat which group you belong to." My child #4 is a Morning Person. She sooo excited to be awake and see sunlight. What a day to be alive!!! Consequently, in the morning she doesn't know how to speak quietly and in a non-bubbly tone. My child #1 is an Anti-Morning Person. Upon more than one occasions he has (nicely) asked me not to talk to him until he tells me I can. Word to the Wise: If you say "good morning, Matt," don't take offense if he doesn't answer. He'll respond in an hour or three because it takes that long for the morning to become good. Despite their different opinions on mornings, both find joy during the day. Steven James also wrote: "There's a heaviness to the lightness of Christianity, a somberness to the joy, a depth to the levity, because for every Easter there is a Good Friday. We approach God with reverence and awe (see Hebrews 12:28), and we can't help but have some solemnity when standing before the judge of the universe. But at the same time, we've offered complete joy, inexpressible in its fullness in its power. As Jesus told his followers, 'As the Father has loved me, so have I loved you. Now remain in my love . . . . I have told you this so that my joy may be in you and that your joy may be complete" (John 15:9, 11 NIV). As we deal with strange allergies and those strange Morning People and all the rest of life's woes, we can choose how we respond. With JOY. With WOE IS ME. "[E]verytime we are wounded in this brutal and beautiful world," Steven James writes, "we have a choice of which direction to turn. We can run to our Father or run away from Him." Serious Question of the Day :: When was the last time you struggled with choosing between Joy and Woe is Me? How did you eventually gain the victory? Non-serious Question of the Day :: Got allergies? Morning Person or Anti-Morning Person? Gina Welborn worked in news radio scripting copy until she took up writing romances. 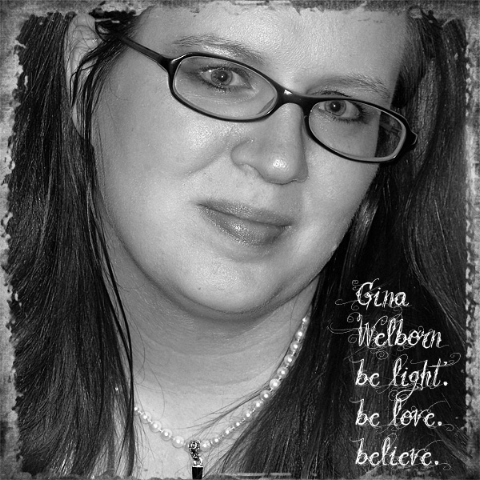 She is a 2009 ACFW GENESIS historical romance finalist and a 2007 RWA GOLDEN HEART® inspirational finalist. As a member of RWA and ACFW, she’s an active contest judge and coordinator. Her inspirational historical manuscripts have also finaled in the Daphne du Maurier, Duel on the Delta, Dixie, and Maggie contests. This Oklahoma-raised girl now lives in Richmond, Virginia with her youth-pastor husband, their five Okie-Hokie children, and a Sharpador Retriever who doesn’t retrieve much of anything. Her first novella, “Sugarplum Hearts,” part of the HIGHLAND CROSSINGS anthology, will be released by Barbour in January 2012. Morning person. Did anyone doubt? I also think I will start carrying the banner of truth in advertising and call it a reddish purplish onion. Thanks for helping me see the reality. Woe is me? I had a moment or two this week. They are much harder to resist when I am physically exhausted. I used to be a morning person- all chirpy etc... not so much anymore. I'm a wee bit out of sync. When I'm in a slump I know I need to take action- DO something- I can be such a slug so doing anything can be such an improvement! Gina, I love onions too! I'm really sorry about your allergy. I am allergic to whey protein in milk products. Thanks so much Gina. Glad you enjoyed Sailing Between the Stars so much. You can now officially join me in the Steven James nonfiction groupie fan club :) Everyone needs to read this book. And you hit the nail on the head when you mentioned physical exhaustion. No matter what our personality, there are times when, against our heart's desire, we fall in a pity party with WOE IS ME. Oh, Cheryl, it is such the time for coffee. Only I have to wait until Happy Hour at Starbucks. Four hours from now. Well, three hours and forty-eight minutes is anyone is the counting type. Whey protein allergy?! Hmm. I don't think I'd like to have that one. I touched the ziploc baggie that has the remaining chopped red/purple onions in it. My fingers started itching. Why touch it? I guess I'm still not convinced that I could be allergic to onions . . . or at least those onions. Dina, I am greatly a Steven James nonfiction fan. Even went to Lifeway yesterday to buy one of his other non-fiction books. Nada. While there were lots of other good books to buy, my heart wasn't in it. Might go back today and buy The Pawn, one of his fiction books. Matt would like it. I'm at my writing retreat at the Abbey and instead of writing I'm waiting for pics to load. No, don't yell at me... the pics are for my Inky post on History Tues and it's about my story and the research I did en route. I am so enjoying this mug of flavours! Anyway, I pulled up and read today's post and I gasped at the questions. No fair, Gina! "When was the last time you struggled with choosing between Joy and Woe is Me? How did you eventually gain the victory?" I haven't gained the victory yet because I'm struggling now! However, I handed it over to Jesus when I said my prayers last night and when I woke this morning, my first thought was that maybe God had different plans for me. I thought I was writing my current wip for a certain market. And the editor of that market would've seen it if I'd finaled. But what if God had other plans? Of course, that doesn't help when I've just rec'd my scores. But like I said, I'm still struggling. With God's help and those people He's given the task of supporting me (who are working overtime at the moment), I will gain the victory. Excellent post, Gina. Thank you. OMG, Anita, that coffee sounds wonderful. Tomorrow's devotional is kind of a part two to today's post. :-) Guess you could say I'm trying to focus on having joy amid the onions. Gina, order them online. Story is great. I've also read A Heart Exposed, which is a collection of prayers, but Sailing is my favorite. Great post, Gina! And Anita, you are now our official barrista. I need you to come and bring those coffees! When was the last time I struggled between Joy and Woe is Me? Uh, about an hour ago. I'm not morning. But I'm better at mornings than nights anymore. I haven't slept in in way too long. I'd be so sad if I were allergic to onions. Poor Gina.